Do you work in a place where hand and power tools are commonly used? Do you do a lot of work with power tools in your home? If so, knowing the steps you can take to be safe around these potentially dangerous tools is crucial. 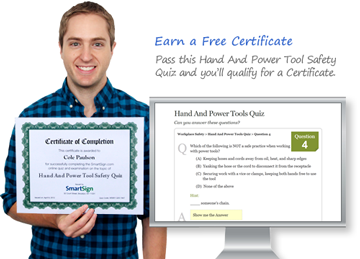 Here at MySafetySign.com, we’ve made testing your knowledge and educating yourself about hand and power tool safety easy with this fun and free quiz. Being informed about what to do before, during, and after using hand and power tools has the power to prevent injury in the home and workplace. With such an extensive collection of safety articles, why put together these series of quizzes? We feel that staying informed about safety of all kinds should be fun and informative, not inaccessible and boring. These quizzes offer a variety of multiple choice and true/false questions and can be completed in a matter of minutes – they’re a great way to stay informed, and maybe even have a little fun. Think you're already a hand and power tool safety expert? • What should workers operating a jackhammer wear? • What makes wedges, chisels, and draft pins unsafe? • Where is it appropriate to use electric tools? • How often must jacks used continuously at one site be inspected? • Employees working with which tools are advised to wear eye, head, and face protection, in addition to the required eye protection?